We're more than a little bit obsessed with marble. It's elegant (after all, this is the stuff that covers opulent palaces and grand mansions), and totally versatile. Case in point: You can easily work it into any room, from kitchen countertops and backsplashes to coffee tables and office accessories. Lately, we've been lusting after marble bathroom floors. Of course, there are a few things to consider before committing. Namely, the cost. That said, you can find faux Carrara and Calacatta marble that are dead-ringers for the real thing. We won't tell if you don't. 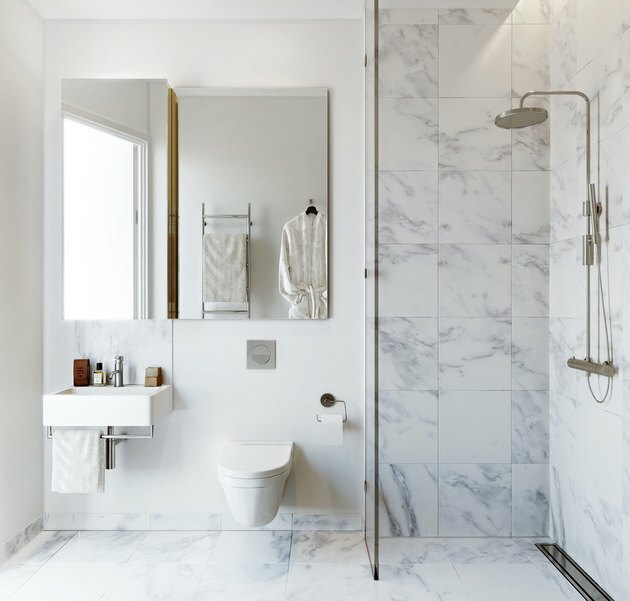 And, while it's less durable than porcelain, if you choose a high quality option and care for it properly — meaning avoiding contact with hair dye and super acidic cleaning products — marble will look fabulous for years to come. Convinced this beautiful material may be your ticket to a stunning spa oasis? Without further ado, here are six hotel-worthy marble floor ideas to inspire your next reno. 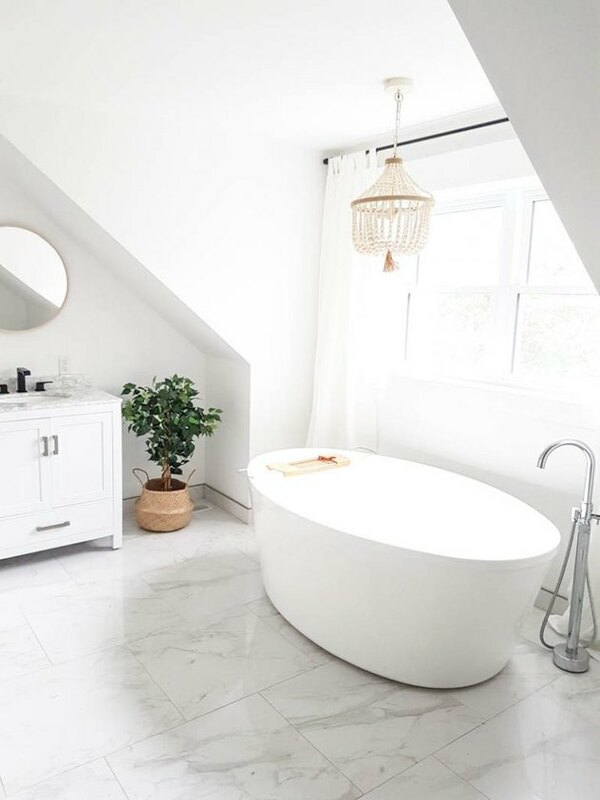 Gemma from The Sweetest Digs puts a sophisticated twist on classic, all-white design with marble floors and a freestanding tub. A beaded chandelier ups the glam factor, while lending a touch of whimsy and bohemian flair. And if you're concerned about it being too slippery, simply add an area rug. Voila! Problem solved. Why stop at the floor when you can keep the marble party rolling right up to your bathroom walls? This Scandinavian bathroom keeps things simple and uses the same square tile on both surfaces, resulting in an elegant and cohesive design that feels light and airy. In this modern refuge designed by Kirsten Grove from Simply Grove, herringbone tile beautifully showcases the natural veining and color variation of the stone. A midcentury dresser was repurposed as the vanity, topped with a marble countertop and an undermount sink. 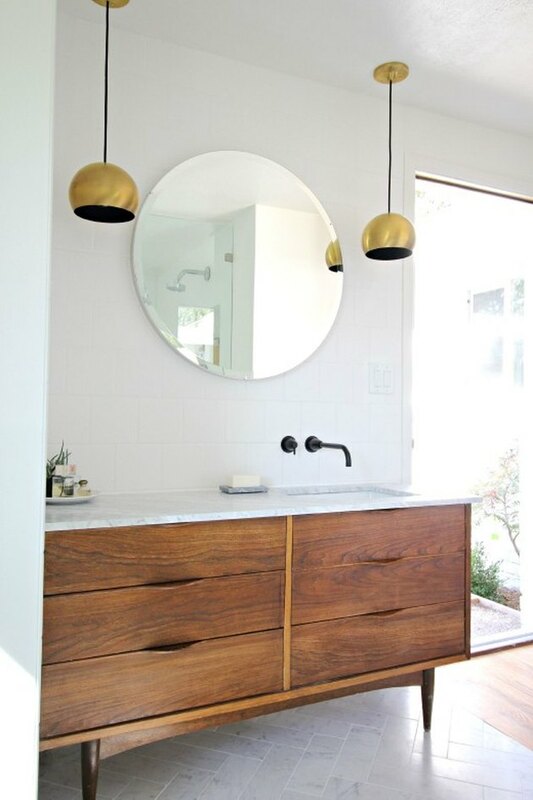 The black wall mount faucet and sleek brass pendants round out the refined vibe. Swoon! Add dreamy texture to your marble bathroom floor with square mosaic tile. We love the way it looks in this farmhouse sanctuary designed by Brooke Wagner. It keeps things interesting without distracting from the star of the show — the black freestanding bathtub centered in the room, right below the skylights in the vaulted ceiling. From the hexagonal mosaic floor tile to the console sink countertop, a majority of this Parisian-inspired salle de bains designed by Hackett Holland is swathed in character-rich marble. 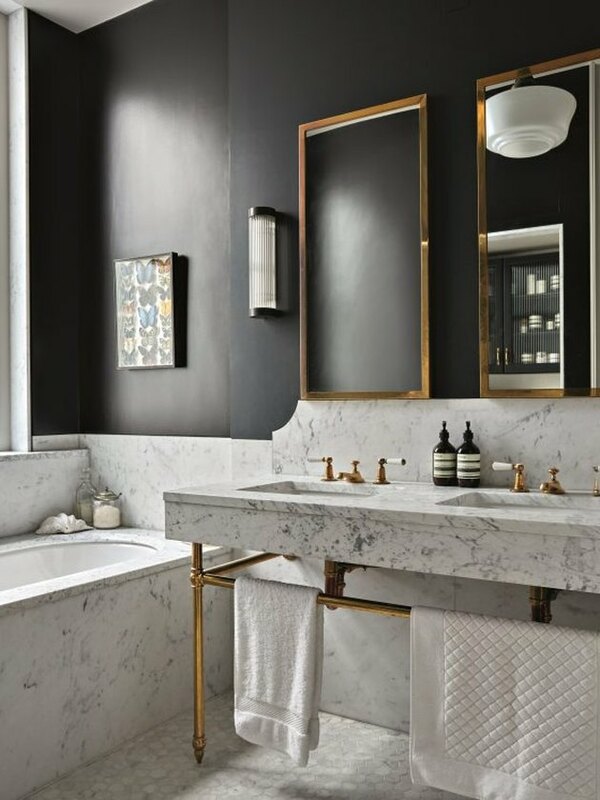 Dramatic black walls and a few luxe brass accents pull it all together seamlessly. Sure, a marble bathroom this spectacular comes at a cost, but the effect is extraordinary. Ooh là là. Dreaming of a Pinterest-worthy master bath? Take a cue from Shea over at Studio McGee. Consider marble floor tile in a playful geometric pattern like the one she chose for this lake house respite. 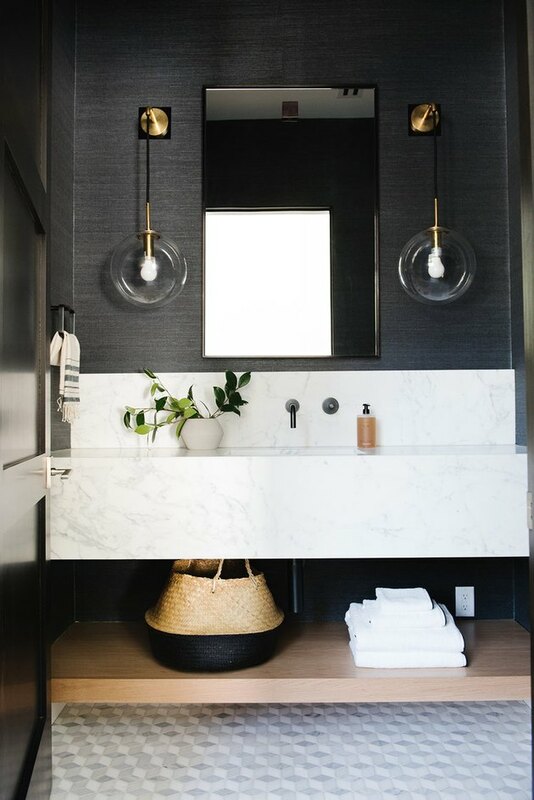 Paired with a floating marble vanity, black grasscloth wallpaper, and a pair of glass globe wall sconces, the finished result is simply striking.